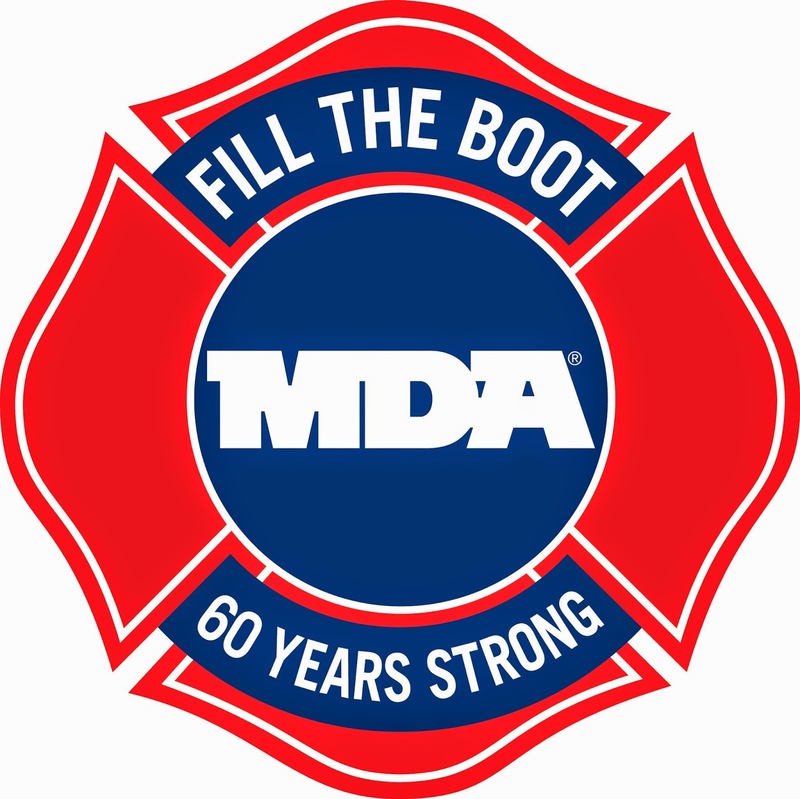 Spokane, Washington, August 15, 2014 — Members of the City of Spokane Fire Department Local 29, along with the Muscular Dystrophy Association, will celebrate their 60-year partnership and kick off the fire fighters' annual Fill the Boot fundraising campaign to benefit children and adults affected by muscle disease throughout the City of Spokane. Fire fighters will be out on the streets with boots in hand for this year’s drive on Friday, August 15th from 3PM-6PM. There will be 16 intersections throughout Spokane with Fire Fighters Filling the Boot. Funds raised through the 2014 Spokane Local 29 Fill the Boot event will help support MDA's programs of worldwide research, specialized health care services, and day-to-day support – which includes sending children affected by muscular dystrophy and related diseases to a weeklong, barrier-free MDA summer camp at Camp Twinlow in Rathdrum, Idaho. 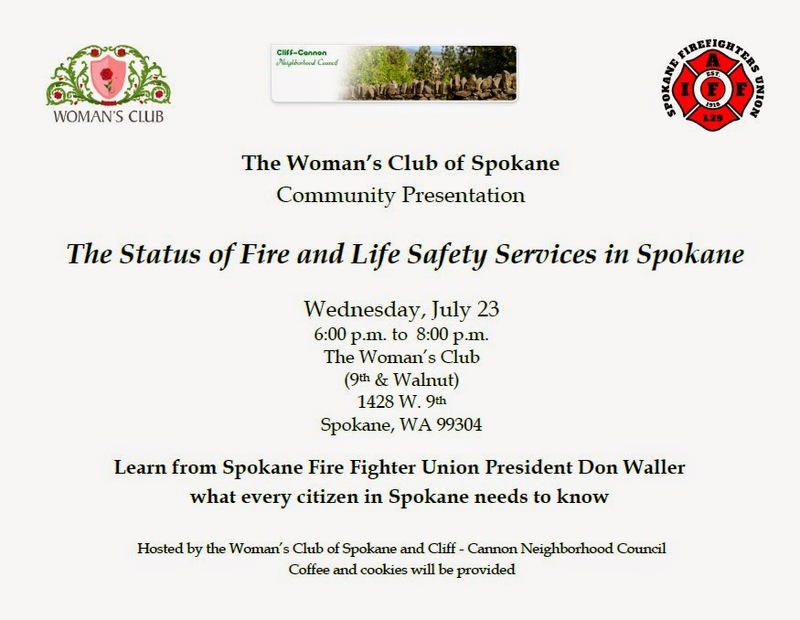 On Wednesday night Don Waller, president of the Spokane Firefighters Union gave a presentation at the Woman’s Club to a group of community leaders and concerned citizens. Waller’s presentation outlined the steady erosion of the Spokane Fire Department services due to declining staffing levels, inadequate funding and aging equipment. Waller acknowledged that city leaders are aware that there are problems but said that the city is only able to come up with band aid solutions. For example a new program that staffs single person SUVs to go on lower priority calls does keep large fire engines in service, but it is only a short term fix. Waller also mentioned that one section of town, Eagle Ridge, has such poor fire protection that some residents were unable to even get insurance on their houses. The city’s remedy was an automatic aid agreement with Fire District 3. But again this was just another band aid. The city acknowledged that this did nothing to improve fire service to Eagle Ridge and was only implemented in order to help residents get fire insurance on their houses. You've heard us talk a great deal over the past couple years about the fire protection problems here in Spokane. Decreased staffing, increased call volume, and aging equipment have created a public safety problem for our citizens, as well as increased risk of injury or death for our firefighters. There is a solution, but the time to act is now! Please come to our community meeting on July 23rd at 6PM, at the Women's Club at 9th and Walnut. We will be hosting a forum to talk about the state of emergency services in Spokane, and what can be done to fix it. See you then. 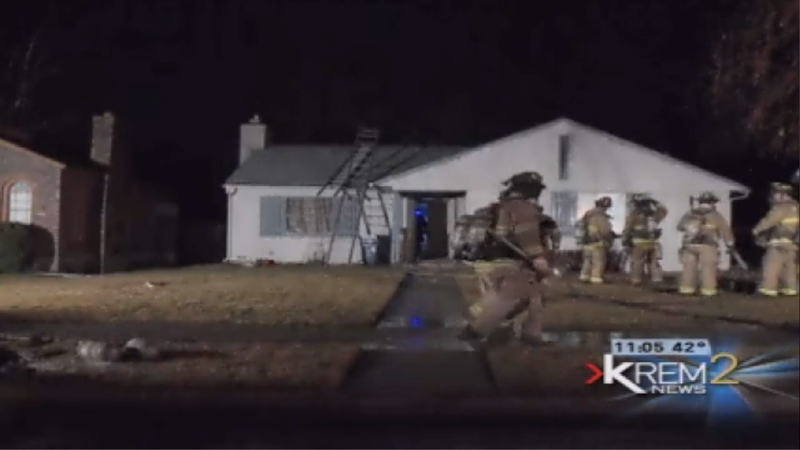 Narrative: Early Saturday morning at 3:21 A.M. the Spokane Fire Department responded to a house fire in the 2500 block of E. 3rd in the East Central Neighborhood. Engine 7 from their neighborhood station location of 1st and Magnolia was first to arrive. Crews found an upper level bedroom involved in fire. After stretching their hose lines, crews knocked down the fire in short order. All occupants escaped and the fire was confined to a mattress, box spring , furniture and contents. Fire crews spent the next two hours finishing extinguishment and removing water and debris from the home. The Special Investigation Unit from the Spokane Fire Department was called into the scene. At this time, the cause of the fire is unknown however, the scene of the fire is still being processed. A total of 18 firefighters responded on this fire. There were no reports of injuries to civilians or firefighters. Cause: Under investigation at this time by the Spokane Fire Department Special Investigation Unit. Damage: Mattress and box spring were totally destroyed along with some furniture, a fan and bedroom contents. Narrative: The Spokane City Fire Dept. dispatched firefighting crews and their apparatus to 212 N. Magnolia at 10:47 hrs on Saturday morning, May 31st, for a reported structure fire at that address. Engine #7, from the near-by Lower East Side Neighborhood fire station, arrived on scene and reported by radio that there was heavy black smoke being pushed out from the eaves on all sides of the single story wood/frame dwelling and they reported further that they were going to attempt to enter the structure with a pre-connected hose lead and locate the source of the smoke. The fire was quickly up-graded to a working fire which added additional fire apparatus to the incident. As additional resources were arriving on scene they were given assignments that included roof ventilation, search and rescue, a back-up hose lead to protect the crew from Engine #7, who were now inside and finding rapidly changing fire conditions in the structure. A second fire attack lead was ordered to assist in the fire fight, a water supply was established, a Safety Officer was assigned, and exposure protection assignments were made. Additionally a Rapid Intervention Team was assigned in case any fire fighters became lost or injured inside the structure. The Incident Commander requested additional resources to the fire scene because the crews were taking a beating due to the warm ambient outside temperature and the labor intensive work they were having to do to get at the fire that by now had completely taken possession of the attic space of the structure. The local chapter of the Red Cross was requested to assist the tenants with temporary lodging. After a couple of hours of persistent and aggressive fire fighting the fire fighters were able to get the fire knocked down and to a point in the incident where some of the resources could be released to return to their Stations. A fire watch was set up to maintain a Fire Dept presence at the scene for much of the afternoon. Two City fire fighters were injured in the fire fight, one of the two was transported by AMR Ambulance to a local Medical Center for evaluation and treatment. The fire damage to the structure and especially to the roof was extensive; nearly all of the roof and it’s supporting structure were removed and the decision on the building’s future will have to be decided by the owners. The cause of this fire is being investigated by the Spokane City Fire Dept.’s Special Investigation Unit. In all, eleven engines, three senior ladders, one heavy rescue truck, and two Command Vehicles were used at this stubborn fire and 50 fire fighters were rotated into the incident. 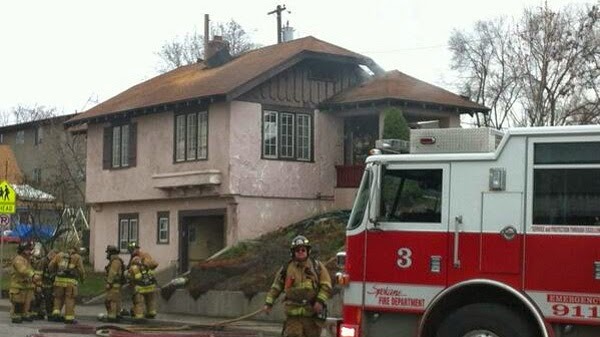 Cause: The cause of this fire is being investigated by the Spokane City Fire Dept.’s Special Investigation Unit. Damage: The roof and supporting structural members of the roof were either burnt off or cut off by firefighters. 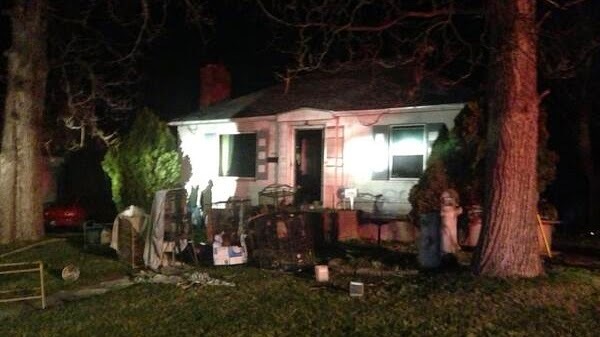 The living areas of the home sustained heavy smoke and water damage as did the contents inside of the home. Judge Kathleen O'Conner rejected an effort by Mayor Condon to politicize the upper echelons of the Spokane Fire Department in a ruling announced Friday. The mayor had sought the right to make political appointments to 14 upper and mid-management positions in the fire department. Currently, all but two of those positions are subject to the merit-based civil service rules. Judge O’Conner ruled the effort was illegal and described the mayor’s justification as “ludicrous.” Judge O’Conner made the ruling in a case filed by the Spokane Firefighter’s Union Local 29 International Association of Firefighters). The ruling came on the union’s motion of summary judgment in its civil suit against the City of Spokane. The Court ruled that the Mayor's new civil service structure was illegal and violated RCW 41.08, which states a Fire Department may have 1 exempt (non-civil service) position and 1 assistant. IAFF Local 29 was represented by David Bricklin, a lawyer specializing in administrative law and environmental issues with offices in Spokane and Seattle. This Court’s decision re-affirms that city employees should be managed in a merit based system that prevents city jobs from being meted out to political appointees. The history of civil service is inextricably intertwined with the fundamental ideals of American democracy. Civil Service was created to stop the corruption, political cronyism and patronage of the past. The result of these practices was incompetent employees, high rates of employee turnover with each successive administration, and cultures of retaliation and political yes men. The civil service system was created to promote the hiring and promotion of the most qualified applicants in a fair and transparent manner and retains the wisdom and experience of longterm workers. This ruling upholds Spokane’s civil service system as right, and fair, and able to put qualified people into the positions that can best serve the needs of the people of Spokane. The mayor’s proposal was not limited to the fire department. Mayor Condon did the same thing to the police department too, politicizing many its management positions. Judge O’Conner’s ruling does not immediately affect the police department, but the reasoning is the same. The police officers would need to file their own lawsuit, unless the city voluntarily agreed to withdraw the changes it made to civil service coverage for the police department. The Spokane Firefighters Union also would also like to thank Council members Ben Stuckart, Amber Waldref and Jon Snyder for voting against this proposal when it came before the Council last year. Narrative: This morning at approximately 12:31 AM fire crews from the Spokane City Fire Department were dispatched to a reported structure fire at 1618 W. Maxwell. Responding crews reported heavy smoke visible upon their arrival and upgraded the incident to a working structure fire to add an additional ladder company to the overall response. Engine 3 from the neighboring fire station arrived on scene first and reported fire showing from the back door of the residence with the majority of the fire confined to the kitchen. Engine 3 and fire crews from Station 4 aggressively attacked the fire while other fire crews on scene completed search/rescue, ventilation, water supply and overhaul. There were no reported injuries to civilians or firefighters and the occupants of the home, consisting of 3 adults and 4 children were being assisted by the Spokane Chapter of the American Red Cross. 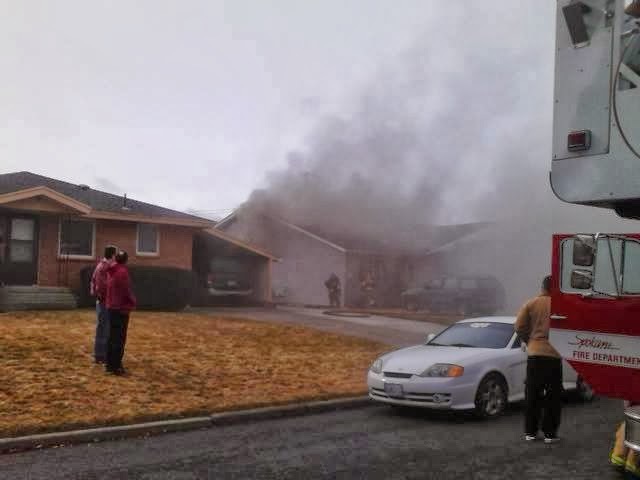 Cause: The cause of the fire is under investigation by the Spokane Fire Department, Special investigation Unit. A cause has not been determined at the time of this media release. Damage: Fire Damage was confined to the kitchen with smoke and heat damage throughout the main floor of the house. Narrative: On Saturday, March 22nd, 2014 at 1:05 P.M. the Spokane Fire Department responded to a structure fire located at 2307 E. Sanson. 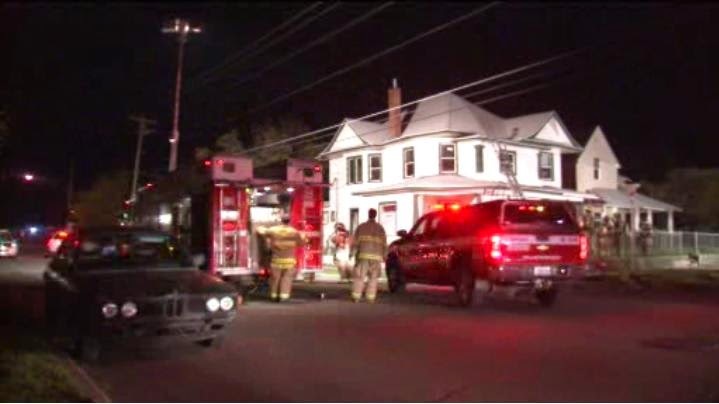 First arriving crews found an attic that was charged with smoke and once inside, confirmed a fire involving walls, the attic space, wiring and insulation. Three occupants made their way safely out of the building. Fire resources were stretched thin as there was a structure fire on the far north end of town in the Shiloh Hills neighborhood that was ongoing. Engine 17, who was filling in at Station 15 located at Wellesley and Crestline, was first on the scene and began to set the scene up for fire attack, search, and ventilation tasks. They were assisted by Engines 8, 6, 14 and Ladders 1 and 4. Crews confined the fire to the attic and prevented it from spreading to the roof above. In their search of the smoky fire, crews used their thermal imaging cameras to pinpoint the source of heat. The fire was successfully knocked down in short order. There were no injuries to civilians or firefighters. The electrical system in the home was compromised because of the fire and the Red Cross was summoned to take care of the occupants. Avista assisted with the electrical issues and natural gas in the area. The fire is currently under investigation by the Spokane Fire Department Special Investigation Unit. Damage: Fire, Smoke and Water damage throughout the home. Avista Company, American Red Cross. Narrative: On Friday, March 21st, 2014 at 7:55 P.M. the Spokane Fire Department, Spokane International Airport firefighters, and Fire District 10 responded to a reported plane that had an on board fire in a cargo hold area. The plane returned to Spokane International Airport shortly after takeoff and after discovering an alarm that had activated plus what appeared to be smoke in the aircraft. Numerous fire companies and rescue units responded along with AMR ambulance. Once on scene, plans were made to attack the fire, and rescue and treat those on board the aircraft. The plane landed safely and crews made sure the 3 occupants on board were safe and at the same time checked for any signs of heat using thermal imaging cameras and FLIR (forward looking infrared cameras). Crews entered the craft with a water charged hose line and confirmed that there were no obvious signs of heat. The plane was then moved to it’s ramp location at the airport, and the occupants then exited safely from the flight deck. Fire crews thoroughly examined all areas of the interior of the plane for signs of fire and did not find any. The alarm activation was thought to be caused by a problem in the auxiliary power unit on board the aircraft. The scene was turned over to the Spokane International Airport and the investigation will continue. Cause: Possibly due to a faulty APU on the aircraft. Damage: Damage total appears to be minimal at this time. Fire District 10, Spokane International Airport, AMR ambulance, Airport Police, Airport Operations, TSA. Narrative: The Spokane City Fire Dept. dispatched firefighting crews and their apparatus to 1024 W. Boone at 22:41 hrs on Friday night, February 28th for a reported structure fire at that address. Engine #3, from the near-by West Central Neighborhood fire station, as they arrived on scene reported by radio that there was visible fire showing from a second floor window at the rear of the 2 story wood/framed apartment building and that they were going to advance a pre-connected lead inside the building in an attempt to get at the fire that was rapidly starting to grow in a second floor apartment. The fire was quickly up-graded to a working fire which added an additional Laddder Company to the incident. As additional resources were arriving on scene they were given assignments that included roof ventilation, search and rescue, a back-up hose lead to protect the crew from Engine #3 who were now inside and fighting their way through the stubborn fire that was being pushed by the extreme winds that were developing outside. A second fire attack lead was ordered to assist in the fire fight, a water supply was established, a Safety Officer was assigned, exposure protection assignments were made, and a Medical Division was established as there were reports of a tenant who may have jumped from a second floor window. Additionally a Rapid Intervention Team was assigned in case any fire fighters became lost or injured inside the structure. The Incident Commander requested a second alarm to get more fire fighters to the scene because the intensity of this now wind driven fire was continuing to escalate and the severe cold temperature was creating problems not only in the self contained breathing apparatus, which are the life line for the fire fighters, but also taking a toll on the fire fighters themselves. The ground around the structure and the street out front were covered in ice making the entire area hazardous for the fire fighters so a truck from the Street Dept., loaded with sand , was requested to help with fire fighter footing, an STA bus was requested so the displaced tenants could get out of the freezing weather, and the Red Cross was requested to assist the tenants with temporary lodging. After a couple of hours of persistent and aggressive fire fighting in terrible weather conditions the fire fighters were able to get the fire knocked down and to a point in the incident where some of the resources could be released to return to their Stations. A fire watch was set up to maintain a Fire Dept presence at the scene throughout the night. There were reports of possible injuries to one or two of the tenants and one fire fighter was slightly injured when he slipped and fell on the ice covered ground. The fire damage to the second floor and the roof of the building is severe and the decision on the building’s future will have to be decided by the owners. The cause of this fire is being investigated by the Spokane City Fire Dept.’s Special Investigation Unit. Eight engines, three senior ladders, one heavy rescue truck, and two Command Vehicles delivered 40 fire fighters to this incident. Cause: Under investigation by the Spokane City Fire Dept's Special Investigation Unit. Damage: Severe fire damage to the second floor and the roof structure. Smoke and water damage to the basement and first floor.